The originator of the style of painting which has taken his name as its title. 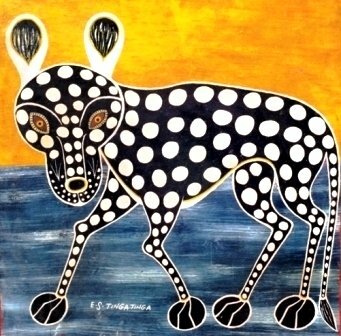 Edward-Saidi Tingatinga was born in Southern Tanzania on the border of Mozambique in a remote village called Ngapa. 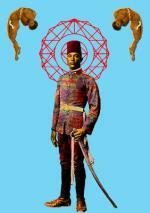 His mother was a Makua and his father came from an Islamic tribe called the Ndonde. All these components become important in adding up to the success of a man who lived an early, rural pastoral life with no formal schooling. Arriving in Dar es Salaam in 1955 he started work as a gardener with an English colonialist. His mother’s family worked for the embassies and NGO’s (non government organisations). Between the two he was exposed to house painters using masonite board and commercial paints and later, institutions who would see his talent and promote him… and posthumously, his work. After his country’s independence he was encouraged by seeing artists from Zaire selling their work to foreign tourists along the roadsides. He started his own studio and working with masonite board and commercial paint he began to create. His imagery was sourced from anything and everything he saw around him: birds, animals, landscapes and village life. In a simple but striking manner he arranged the elements of his compositions without perspective. Using exaggeration of form and pattern he emphasized the particular attributes of his subject matter. This naivety and freshness of approach engaged and resonated with his viewers. His genetic heritage and his exposure to mural wall painting by the villagers on the huts of his tribe all added up to him inherently being an artist who found and took the opportunity to create significant work for us all to enjoy. The lack of sophistication is endearing and there is an unarguable charm to his pieces. In 1971 the National Arts Council show cased his work on a stand at the International Trade fair; his work was beginning to be noticed farther afield than just Dar es Salaam. Working 2 jobs as a nurse and an artist, time was precious; more than he was aware of. In a random shooting one night in 1972 he lost his life to a stray bullet fired in a incident that should never have happened. His life and his short painting career was over. But his legacy was not. 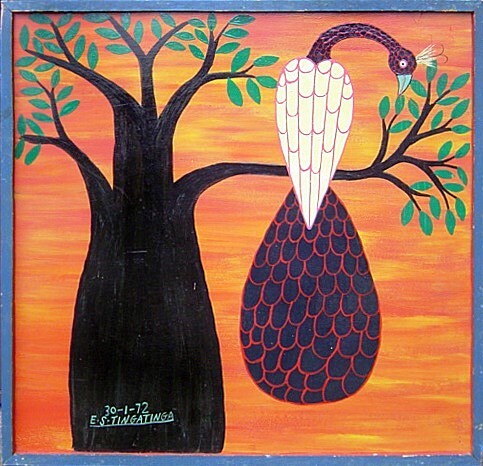 His students and others have continued to paint in Tingatinga style, enjoyed and recognized by both visitors and collectors the world over. 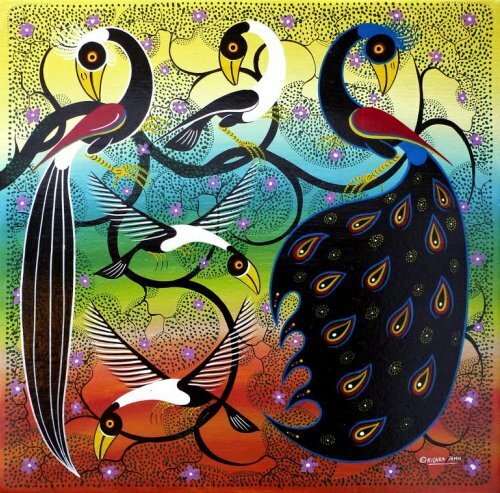 Today there are many commercial artists who paint in a similar style for the tourism trade in Tanzania but there are also a number of talented painters who follow the genre but are established on their own merits. 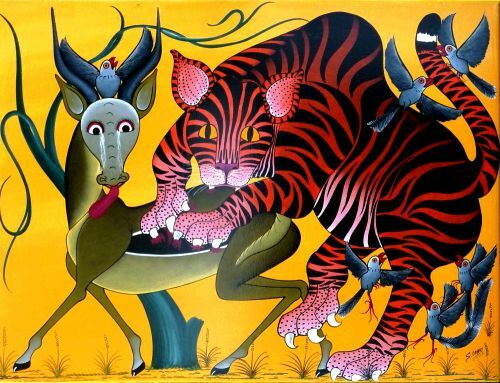 The first Tingatinga exhibition that took place outside the country was in Denmark in 1974 at the National Museum of Copenhagen. 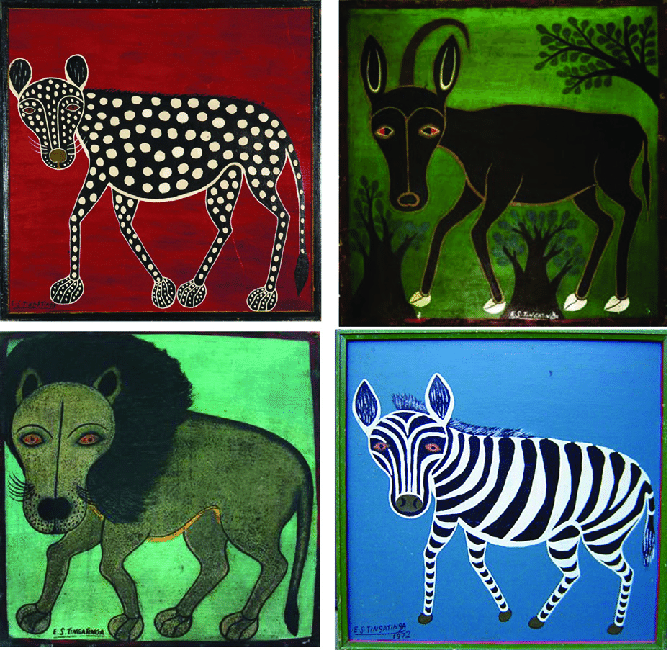 In 2010, another exhibition was organized by thorupART in collaboration with Art Association Koge Bugt which was both a retrospective showing Edward-Saidi Tingatinga originals and featured new work from the School, mostly pieces on canvas.